So my win of the $15,000 PowerUp! Award for my bookstore business plan got written up in the Daily News yesterday, complete with photo of me with a goofy grin on my face (high on endorphins, as John T. surmised). I know the word got passed around at Winter Institute in Louisville, too. Anyway, the congratulations keep coming -- from friends and strangers, many of whom think I should open the bookstore in their Brooklyn neighborhood! It's fantastic to know there are so many folks longing for a bookstore out there. Which is really about two entrepreneurs (like me!) working toward opening The Big Green Bookshop in London, and writing a blog about the process (they've also apparently been bowled over by the publicity from the article). Warning: the blog opens to the tune of "Pleasant Valley Sunday," which I love but you might want to be aware of if you're in a quiet place. I love reading all of the literary folks whose dream bookstore resembles that of Bernard Black in Black's Books, a hilarious cancelled BBC sitcom I've been obsessed with lately. Bernard loves drinking wine, reading books, and being left alone, and hates cleaning, anything new, and customers. Obviously he's a terrible bookseller. And as they admit, many of those who dream of the bookstore life aren't really cut out for it. But as my very first bookstore boss used to say, "that's why there are so many books [or jobs] in the world -- so not everyone has to like the same ones." And it doesn't hurt to dream, does it? Link-Mad Monday: WI3 and "the reading business"
The lovely Lori Kauffman of Brookline Booksmith was live blogging from WI3 on her blog, Brookline Blogsmith; check it out for some impressions of Danny Meyer's opening presentation on hospitality vs. service, Gary Hirschberg's bit on saving the world while making a living, some bookseller/librarian conspiring, and Lori's pick of the galleys. And I suspect there's more to come -- the intensity of the programming can make it impossible to find time to blog, so sometimes it's all about the recap afterward. And of course, today's Shelf Awareness has the first in a series of articles recapping the experience and lessons of WI3, written by John Mutter and Susan Weiss. Looking forward to vicariously absorbing those lessons through them. Again, I'd love to get a bookseller or two to write here about Winter Institute: their overall experience, a specific session or topics, or even the people you met. Send me an email or leave a comment if you'd like to be a guest poster. In the Times piece, Randall Stross politely but thoroughly demolishes this absurdity, and ends with a challenge for those of us in what we now call "the book business". Here's the passage -- I'm curious to hear your thoughts. To Mr. Jobs, this statistic dooms everyone in the book business to inevitable failure. Only the business is not as ghostly as he suggests. In 2008, book publishing will bring in about $15 billion in revenue in the United States, according to the Book Industry Study Group, a trade association. One can only wonder why, by the Study Group’s estimate, 408 million books will be bought this year if no one reads anymore? A survey conducted in August 2007 by Ipsos Public Affairs for The Associated Press found that 27 percent of Americans had not read a book in the previous year. Not as bad as Mr. Jobs’s figure, but dismaying to be sure. Happily, however, the same share — 27 percent — read 15 or more books. In fact, when we exclude Americans who had not read a single book in that year, the average number of books read was 20, raised by the 8 percent who read 51 books or more. In other words, a sizable minority does not read, but the overall distribution is balanced somewhat by those who read a lot. If a piece of the book industry’s $15 billion seems too paltry for Mr. Jobs to bother with, he is forgetting that Apple reached its current size only recently. Last week, Apple reported that it posted revenue of $9.6 billion in the quarter that spanned October to December 2007, its best quarter ever, after $24 billion in revenue in the 2007 fiscal year, which ended in September. But as recently as 2001, before the iPhone and the iPod, Apple was a niche computer company without a mass market hit. It was badly hurt by the 2001 recession and reported revenue of only $5.3 billion for the year. This is, by coincidence, almost exactly what Barnes & Noble reported in revenue for its 2007 fiscal year. In neither case did the company owners look at that number, decide to chain the doors permanently shut and call it quits. The object we are accustomed to calling a book is undergoing a profound modification as it is stripped of its physical shell. Kindle’s long-term success is still unknown, but Amazon should be credited with imaginatively redefining its original product line, replacing the book business with the reading business. For another smart (if slightly cranky) refutation of the "decline of reading civilization argument", I'd recommend Ursula Le Guin's piece in Harper's Magazine -- it absorbed me for most of an evening I should have been doing more practical things at the bookstore, but I feel like I've got more arrows in the quiver for arguments about why things are not now worse than they have ever been. Looking forward to hearing what you think of it all! I actually had a very productive day at work yesterday -- I finished writing up descriptions of upcoming events for February, posted author photos on the website, responded to a number of event requests to tame my overflowing inbox, worked the cash register and answered some customer questions, and even pulled some returns from the interior design section. A good day in the life of a bookseller. I felt content in my life as it is, not filled with longing or anxiety, and just a little excited that at 5:15 I was going to put on my good shoes and go down to the Central Branch of the Brooklyn Library for a swanky awards ceremony and some snacks. Everyone at the bookstore knew I was going to the business plan awards ceremony, and I got lots of "good luck"s as I went out the door. I saw some of the staff from my BEDC class in the audience, and the judges before whom I made my presentation back in November, and the owners of Bogota Bistro, the first winners of the award (conveniently located about half a block from our apartment). Maud Andrews, my favorite librarian (because it seems to me she's found her calling too), asked me about the correct pronunciation of my new last name -- they were confirming with all the finalists, she said. It felt so good to be sitting there next to the ALP, the work all done, the prayers for blessings all said, and I felt I would honestly be content whatever the outcome. There were, of course, lots of speeches preceding the awards: Dionne Mack-Harvin, the BPL's executive director, was the MC (I know her name and title because they're printed on the giant check on my kitchen table), and we heard from the Deputy Borough President (not Marty, sadly, but woman with a lovely Jamaican accent) and a City Councilwoman and representatives from Citibank, congratulating the library and the contestants on the increasing success of the contest. Previous winners also said a few words; the owners of Bogota (who were also the evening's caterers) talked about what an affirmation it had been to receive the award, and how many no's it took before they heard yes, and how well they're doing now -- they grossed over a million last year. Another previous winner, a two-woman toddler t-shirt company, brought up their own kids to showcase their wares -- the tots stole the show, in typical Brooklyn fashion. Then, suddenly, it was time for the awards. The presenters would read a description of the business plan, then announce the entrepreneur's name and have them come forward for the award and photographs. As they announced the first honorable mentions ($500), I thought how that would be a nice chunk of change to start an account with. But I wasn't with the honorable mentions. Then the $750 honorable mentions were presented, and I thought how great nearly a thousand bucks free and clear would be. But I wasn't with those either. Then they announced the two second place winners, and I thought, five grand would be perfect, wonderful, not too much pressure. But the awards went to a woman with a line of aromatic soaps and cosmetics (who couldn't stop crying and saying "I have labels to buy!" - she knew exactly how she was going to spend her money), and another woman who wanted to open a healthy soul food restaurant (I hope she caters next year). Well, it's all or nothing now, I thought. Probably nothing. And that's fine. I wrote the plan because of this deadline, which I might never have done otherwise, and I learned so much, and I met such great resources in the Brooklyn business community. Blessings on the winner, whoever they are. And then the presenter announced that the winning plan was a business that would benefit the readers and writers of Brooklyn. The ALP and I looked at each other, oddly worried expressions on our faces. The presenter described someone who had worked for seven years in the book industry, made lots of contacts, who wrote a bookselling blog. I started to cry. The ALP told me not to cry, so I started to laugh instead. They called my name, pronouncing the difficult hyphenated last name correctly but getting my first name wrong. I somehow made it up to the stage. They handed me a gigantic posterboard check with my name (spelled right) and the words FIFTEEN THOUSAND DOLLARS. The Daily News photographer took pictures. All I could hear was my own ragged, laughing/crying breath. The MC apologized for asking me to say a few words. I hadn't thought seriously about having to speak (okay, it had occurred to me, but I shoved the thought away with an eye-roll at myself and didn't prepare anything), but I found I wasn't afraid. Here's what I remember of what I said -- a bit paraphrased, and minus the stutters and repetitions. "Luckily I host events at the bookstore four or five nights a week, so I'm used to being in front of a microphone... but it's not usually this important. I love what the guys from Bogota said -- one of my favorite restaurants -- about what an affirmation this was for them. I know there's a perception out there that independent bookstores are a dying breed, a bad bet. I know that's not true, because I've seen the ones that are working, that are doing vibrant wonderful things in their communities. And I've gotten so much support from people in my industry -- from publishers, from our trade organization, from other booksellers -- especially from other booksellers, who are such a great community to each other. But I wasn't sure what the response would be when I took this plan to people outside that community, to business people. Would they think I was crazy? And it's so wonderful that you thought this was worthwhile. I honestly was thinking there at the end it's all or nothing, and it's probably nothing, and that would have been okay, because I have gotten so much already out of PowerUp, I've learned so much, and the librarians have been so wonderful. But this money is going to be the seed that I can use to make this dream happen. So... thank you. So. Much." And then about fifteen thousand more pictures, and I could see the ALP still standing there in our row while everyone went out for the reception, and I just wanted to go and hug him, but it was great to be up there with the other laughing/crying winners and their own big posterboard checks. And then I did get to hug him, and we went out and had empanadas and champagne, and I handed out about fifteen business cards and got fifteen more, and heard from a dozen people why I should open my bookstore in their neighborhood, and talked about collaborating with half a dozen other entrepreneurs, and met people who read my blog, and gradually came down to a less ragged high. Then the ALP and I left the library, which was already closed (we showed the check to the security guards at the door, who pulled out pens to joke about having me sign it over to them), and picked up a bottle of champagne at a Park Slope wine shop on the way home. I called my mom, we watched the Muppet Show on DVD, we talked about having the check made into a coffee table. Then we went to bed. There will be a lot of details to work through -- where and how to receive and deposit the money, how to use this as leverage to get additional grants and loans. To be fair, it's less than a tenth of what I've calculated I'll need. But it's fifteen thousand dollars more than I had before, not to mention the $5,000 in in-kind gifts: consulting services, marketing services, a Chamber of Commerce membership, even a gift certificate to Bogota. And perhaps more importantly, the experts of the Brooklyn Business Library think my plan is viable -- is the MOST viable, out of all the ones they've seen. Kathleen, the Citibank rep responsible for creating the contest and the head judge, told me that it was my presentation that made the difference -- that the judges were skeptical about the wisdom of opening an independent bookstore given all they'd heard, but I sold them on the idea with my data and my passion. If I can do that -- and I guess I did -- maybe I can do anything. Maybe I can make this dream happen, after all. Thank you to all of you who have also given your affirmation. Thank you for saying yes in a world of no's. Now, if you'll excuse me, I'm going to bask in the glow for a little while longer. P.S. They tell me I'll be in the Daily News on Tuesday, in the Brooklyn section or the business section, if you want to take a look. So much going on there's just not enough time for everything! Wednesday evening is the awards ceremony for the Brooklyn Public Library's PowerUp! business plan competition -- the ALP and I will be there to hear the winners announced. I'm looking forward to seeing what great businesses are being planned in Brooklyn, and getting some feedback on my bookstore plan... so send some good vibes my way if you think about it. I've got some new writing assignments lately -- I'll let you know when there's something to read, but I don't want to jinx myself by promising too much. Right now I'm feeling a bit too sleepy to imagine writing. I spent part of the morning at Old First with an incredible project for fighting homelessness in New York -- the staff and volunteers of Common Ground work 24/7, and the people they're helping don't always have the luxuries of hot showers and naps. It's good to put things in perspective, and better to try to help -- I don't know how much good my presence did, but I was there, and I'm hoping I can go again. Hope you're having a good Tuesday, too. Data: Happy Days Are Here Again! Bookstore sales in November were $1.186 billion, up 7.5% from $1.103 billion in sales in November 2006, according to preliminary estimates from the U.S. Census Bureau. For the year to date, bookstore sales have been $14.654 billion, up 0.8% from $14.532 billion in the first 11 months of 2006. This marks the fifth month in a row that bookstore sales were up over the same period last year--and the second month in a row that year-to-date sales have topped last year's comparable figures. Okay, it's a small increase, and a short-term trend. But it does seem to me to challenge the idea that things are just eternally spiraling downward for the book industry, and especially for bookstores. Note that "under Census Bureau definitions, bookstore sales are of new books and do not include "electronic home shopping, mail-order, or direct sale" or used book sales." So this is just brick and mortar stores, with sales this year better than the year before. Hooray! Friday I'm in Poughkeepsie at BookStream (and keep an eye out for some cool announcements from there soon!) I'll be back with some book reviews on Monday. Happy reading! Link-Mad Monday: New Year, New Bookstores! You may have already seen this, but the ABA has officially announced that 115 new independent bookstores opened in 2007! Apparently, it's the third year in a row that we've seen over 100 new store openings. You can look here for the full list of new stores -- -- there may be a new indie store near you. I found 4 of them just in the five boroughs of New York -- woo hoo! I'll have to update my own ongoing list of local indies, which is currently pushing 70 -- I love to pull it out whenever anyone laments the fact that there are "no more independent bookstores" in New York, and we often use it at my bookstore to refer customers looking for something specific. Now they've got even more options. And more folks are discovering that's the case. In the Huffington Post last week, Michelle Haimoff writes about seven great New York indie bookstores, which she calls "The Secret New York Alternative to Barnes & Noble." McNally Robinson gets a nice mention, as do some of my other favorites. Also in our fair city, Book Culture (formerly Labyrinth) has a new blog. If I recall correctly from my days working there during the coursebook rush, the Seven Shopping Tips for Students will be especially helpful (not least to the harried staff!) And the store's new events and marketing manager Kelly Amabile also has her own blog, with reflections on a life in books and working in an indie bookstore. And it looks like 2008 is going to be another good year for indies. The ABA blog led me to Justina Chen Headley's Five Ways to Support Your Local Bookstore, inspired by the closing of her local Seattle store M Coy, and picked up by a number of other bloggers. It's another indication that consumer awareness about supporting indies is on the rise. If you want to know how independent booksellers really are doing, come ask us. Reacting to the closing of one bookshop by saying it is another death-knell of an industry simply isn't fair or correct and can be counterproductive. It can also mislead customers and drive more into the hands of the corporate Big Boxes, encouraging the difficulties that small independents face. Why not do a story about how some independents are doing fine because of their customers who want to support small businesses? Isn't there a story in that? Based on the stories I've been discovering this week, clearly there is! Do you have any good stories? What are your hopeful signs for the new year? New year, time to update the ol' Blogger template, eh? In his December 26 post, fellow bookseller/blogger P.J. Grath muses "Is there a bookseller alive who can resist books recounting the experiences of other booksellers?" It seems the same is true of blogs. I've realized that my Google reader is increasingly populated with blogs by booksellers, and that they tend to be some of my preferred reading. In spite of many great blogs focused on a specifc genre, on developments in the book world, on the reading of a particular person or group of people, I find that more and more I want to read about fellow booksellers in the trenches. Those blogs tend to include reviews and news, but also stuff about the daily retail life. I'm feeling irresistibly warm and fuzzy thinking about this little community of us. So I've added a whole new category to my links on the right: Bookseller Blogs. These are just the few that I tend to read on a regular basis. Kash's Book Corner out of Boulder is rightfully famous (his December 8 post particularly cracked me up, and made me realize we weren't alone in our pre-holiday paranoia). Grath's Books in Northport is rapidly becoming one of my very favorites, especially the pictures of her cozy shop, Dog Ears Books, in all that Michigan snow. Bookdwarf is an old fave, of course, and I love it when Megan writes about doings at Harvard Bookstore. Constellation Books in Baltimore I'm proud to have inspired to start blogging (and Lauretta and the rest of the staff are doing an awesome job! ), and Lori of Brookline Blogsmith became a bookseller friend at the last NEIBA. Atomic Books are my pop-culture idols, of course. And there are tons more out there. I found the Inkwell Bookstore Blog just by searching for other Blogger profiles that listed "bookseller" as their occupation. There are 519. I tore myself away from reading the whole list (I do have work this morning), but I can't wait to explore them. 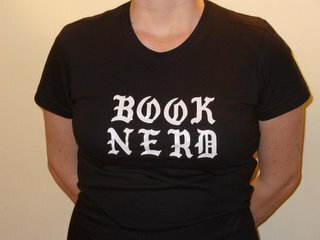 And I'd just be willing to bet that you Written Nerd readers have your own favorite bookseller blogs. Care to share, so I can add them to my blogroll too? Coincidentally, I'm currently working through another anthology that benefits a Brooklyn nonprofit. The Book of Other People (also from Penguin), the long-awaited (by me anyway) collection of character sketches edited by Zadie Smith, benefits 826NYC (also known as Brooklyn Superhero Supply Co., where I volunteered in a less time-bereft time in my life). There's also a ticketed reading for this one on the 16th; ticket sales also benefit the tutoring center, which is doing really good work (not hurt by having lots of famous friends). I DID buy this one, for a funny reason: the ALP and I took the train to Boston to see friends over New Year's, and while waiting to meet up with our ride in South Street StationI was so delighted to discover a little independent bookstore that I bought the first book that looked readable -- in this case, the just released BOOP. I guess Barbara's Bestsellers isn't exactly an independent -- they seem to have locations all over the country -- but it's definitely got an indie vibe, and I'm always glad to add to my collection of souvenir bookmarks from my bookstore visits. Anyway, in addition to stories by my favorites Jonathan Safran Foer, Andrew Sean Greer, Nick Nornby, A.L. Kennedy, Jonathan Lethem, and Smith herself, there is also (drumroll please)... a new story by David Mitchell! I didn't even realize this when I plunked down my cash. A karmic payback for buying a book for a good cause. I recommend you do the same at your local indie bookstore, ASAP. I just want to say thanks to all of those who have responded -- in comments, in emails, on the phone, and in person -- to my rather sad end-of-the-year post, and who have said, in essence, Buck Up. Reading's not in decline... you've done so much already... a bookstore is worth waiting for... you'll do it someday... etc. You're all awesome. Your enthusiasm and optimism, and your confidence in me, is like fuel to a fire. It's so good to have that encouragement -- better even than money. Aside from finally getting over a lingering stomachache I had over New Year's, your comments are the only thing to which I can attribute getting out of the blue funk I've been in. I'm excited again, and ready to roll up my sleeves. People are not generally negative about their own lives... In contrast, we are unduly negative about the wider world. As a government adviser, I would bemoan what we in Whitehall called the perception gap. Time and again, opinion polls expose a dramatic disparity between what people say about their personal experiences and about the state of things in general. Today, there are signs of a yearning for new ways of working together. There is the growing interest in social and co-operative enterprise and the emergence of new forms of online collaboration... Despite the huge impersonal forces of the modern world, people are prepared not only to believe in a better future, but to work together to build it. This is what we've got: in our indie bookstores, in our communities of readers. Ways of working together. The possibility of "self-actualization." An alternate story about the world. A good neighborhood. A better world. America in 1907 read more than most of us. But did America of 1907 read smarter than us? Transported back to America in 1907, would we savor a book culture less dumbed down than ours? Well, let's take a look at the bestselling fiction of 1907. All 10 were potboilers unknown today. The top seller was "The Lady of the Decoration" by one Frances Little. Others on the list included the likes of "The Port of Missing Men" and "Half a Rogue." Sounds a lot like the mass market portion of the New York Times Bestseller list, eh? At least in paperback fiction we've got Atonement and Water For Elephants (which started out on the BookSense bestseller list, a compilation of sales just from indie bookstores, that tends to be decidedly more "literary" than the Times list, though it's not without its potboilers), and Garcia Marquez's Love in the Time of Cholera, pretty hard to dispute as a literary novel. So despite this article in Commentary criticizing Maud Newton for thinking about books like movies, maybe the movies (and TV, and iPods, and other technologies) haven't dumbed down our reading tastes so very much. Regular folks have always loved and still love adventure and romance and escapism. I just finished the amazing The Amazing Adventures of Kavalier & Clay (review forthcoming), which isn't escapism but is about a "long underwear" comic literally called The Escapist (and makes a case for its poignancy and cultural impact despite its schlockiness). And I've spent a lot of time lately reading Agatha Christie. But there's possibly more room for the smart stuff to succeed now than there's ever been. I wouldn't have minded living in an era when all the men wore hats. But I think now is a pretty good time to live for the literature.